HomeSmartphonesAndroid NewsWhich Ring Alarm kit should you buy? Best answer: We’d recommend Ring’s 8-piece Alarm Security Kit for most homes. It’s an 8-piece set which includes multiple contact and motion detectors to cover most entry points of the home, and you can get it all for a good price. When shopping for a home security system, you always start with one consideration: your home. How many doors do you have? How many windows? How much outside ground do you want to monitor? These are important questions to answer because it’ll give you an idea of how much equipment you’ll need for proper coverage. The trick is to get as close as possible to the number of sensors you need without spending too much. If you can get close to the number of items you need in the same bundle, you’ll save yourself a good chunk of money. Most average homes have two main points of entry and several windows on the bottom floor. If this is you and you’re shopping for a Ring Alarm Security kit, the 8-piece configuration should be enough to get you started. You’ll get three contact sensors, which are the devices you put on doors to be notified whenever they’re opened. This is the perfect number, as you’ll get enough sensors to cover the front door and backdoor, as well as a third for a patio door or one of your main windows. The 8-piece kit also comes with two motion detectors, enough to cover a couple of the main rooms in your home. Where you can’t install a motion detector you can choose to cover a window or door on that part of the house with a contact sensor. All Ring Alarm Security kits also come standard with the base station, a keypad, and a range extender. You can also use any of them on any of Ring’s Protect Plans. While Ring’s subscription plans allow you features like video recording and alerts, it can also add more to the overall price tag, making this 8-piece bundle even more appealing. If you’ve bought one of Ring’s Alarm Security Kits and come to the conclusion that you need more, don’t fret. You can buy individual pieces of equipment to fill out your home. Ring offers extra contact sensors, motion detectors, keypads, and range extenders on an individual basis. You can also get a number of extras such as an alarm sound amplifier, as well as add other pieces of equipment from the Ring family such as smoke and CO alarms, flood and freeze sensors, security doorbells, and security cameras. Smart lighting systems will also be available soon. Be sure to explore all of your options over at Ring’s website. Monitor and protect your home. 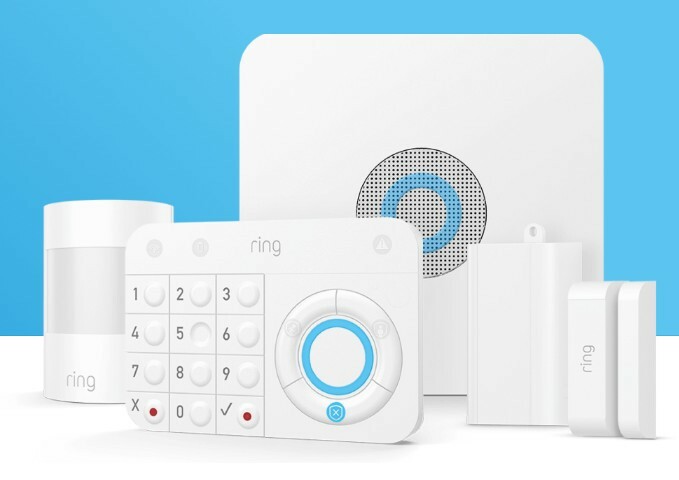 Ring’s suite of home alarm products let you know exactly what’s going on around your home, and it’s all managed inside one easy app.